THONON WEST AREA. 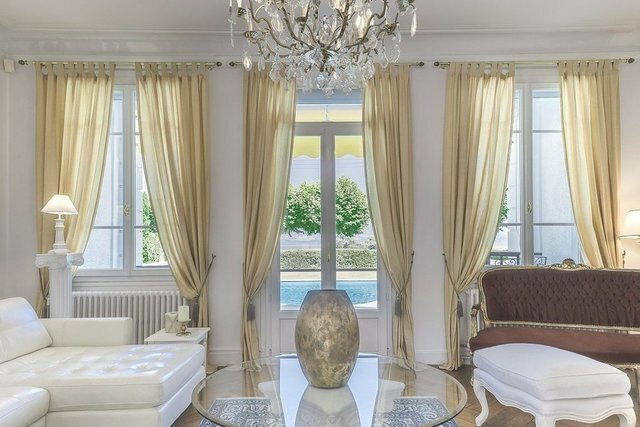 Located in the west area of Thonon, this neoclassical-inspired property has 200 sq. m of useful floor space on 2 levels. It consists of an entrance, a beautiful living room overlooking the exterior and an equipped kitchen. The house has 3 bedrooms, 2 bathrooms and a shower room. Its cleverly designed layout, high quality materials with its herringbone parquet and marble make this house an exceptional property. In the basement are a laundry room and a space to develop offering multiple possibilities. A garage completes this property. The land of 1570 sq. m has a heated pool and a beautiful view of Lake Geneva. This property also has an independent house of 80 sq. m fully equipped that can serve as a caretaker's house or guest house.